We’ve got a very special treat for you! Eleven different superhero blogs have combined forces today to each cover the same topic! 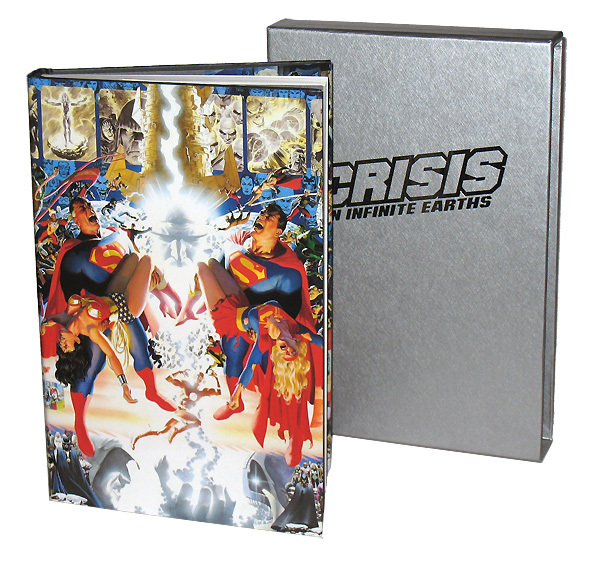 All of them will focus on the George Perez/Alex Ross painting from the Crisis on Infinite Earths 1998 hardcover. Each blogger is writing their own entry, highlighting the character their site is dedicated to. For example, we’ll be focusing on Firestorm here. For more information on this crossover, read to the bottom of this post. George Perez and Alex Ross – two artistic powerhouses. There is no denying that both of these artists took the comic book industry by storm; Perez in the 1980s and Ross in the 1990s. Their amazing work helped to encourage everyone else in the industry to bring their work up a notch. To this day, they are still two of the most impressive artists working in comics. In 1998 they collaborated to create what I consider to be the ultimate representation of the DC Universe. The 12-issue maxi-series Crisis on Infinite Earths was originally published in 1985/1986. It wasn’t collected until DC released a slipcase hardcover edition in 1998. To commemorate this landmark series, George Perez pencilled an enormous drawing for the wrap-around dustjacket featuring every DC character to appear in the maxi-series (562 characters total). Alex Ross then stepped in to paint this colossal image. The finished product is simply amazing. DC also produced a poster of the wrap-around dustjacket. In order to showcase all the fantastic detail in the painting, they had to make the poster oversized – 5 feet 5 inches wide by 2 feet 5 inches high. The poster is hanging over my computer and I find myself studying the hundreds of characters quite frequently. Here is their rendition of Firestorm from this breathtaking work (also notice Professor Stein’s floating head). At first glance, it may appear to be missing some detail or definition. Just keep in mind the size of the overall image and how small Firestorm must have been on the actual canvas. Personally I’m rather pleased that Perez placed Firestorm just over the right shoulder of the Earth-2 Superman (the original Superman that first appeared in 1938). It seems like a place of respect. Here is their rendition of Firehawk. She appeared in the top right hand corner of the image. You can find a guide-map of all the characters in this impressive painting over at the Annotated Crisis on Infinite Earths web site. Rob Kelly (the blogger who inspired most of us to start our own superhero blogs) rolls out the pomp and circumstance for the King of the Seven Seas and the royal Aqua-family over at The Aquaman Shrine. Also, thanks to Rob for the excellent “Crisis on Earth-Blog” logo! Blogs will live. Blogs will die. And the Blogosphere will never be the same! Crisis on Earth-Blog! Posted in: Comic books, Crossover, Firestorm #01: Original (Ronnie/Martin), George Perez. I love the little floaty head of Dr. Stein! The colors on Firehawk’s wings are really swank as well. Thanks for putting this whole she-bang together, Shag! I can’t believe that we even all got links from tghe official George Perez site on this. Thanks for including me in all of this Shag. Wow, I didn’t know that! How cool that its mentioned on Perez’s site. 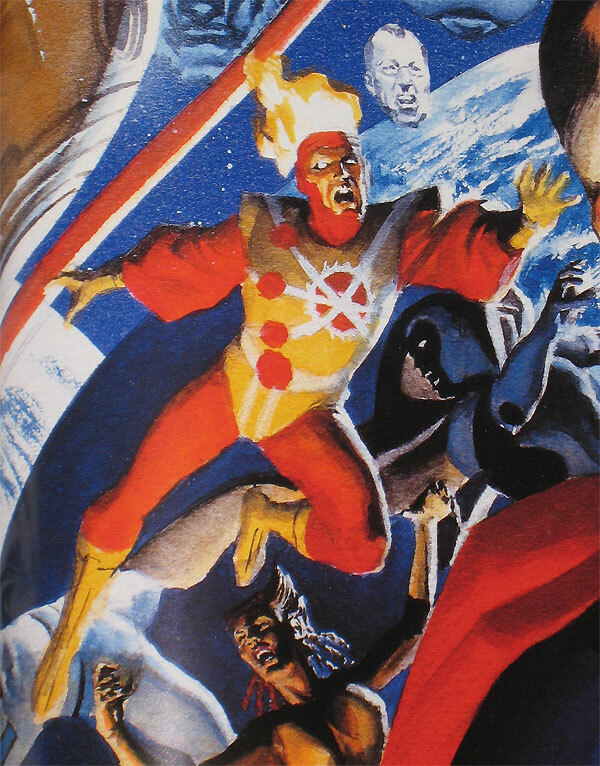 Is this the only time that Alex Ross has ever done anything with Firestorm? 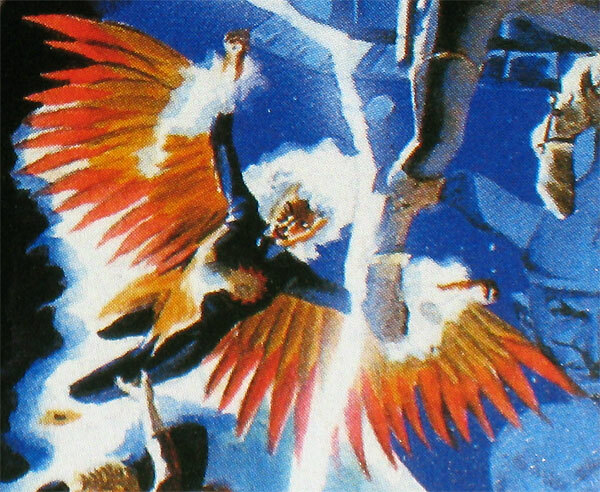 I have tons of Justice League artwork from Alex Ross and it seems as if he deliberately leaves out Firestorm each and every time. Shawn – Interesting observation. I’ve also noticed this with Alex Ross. I’ve read a few fan sites stating that Alex Ross stopped reading JLA (volume 1) when Firestorm joined. I don’t have any proof to back that up, but that’s what I’ve heard. hi, i’m fazir from Malaysia…. appreciate if u can email me the high resolution of this poster…. …..imagined this poster hang in my wall…. wow…. Sorry irafazir, I don’t have a high-resolution copy. And the poster is enormous, over 5 feet long! You might still be able to find the poster online somewhere. Good luck!